Vintage From Paul is delighted to offer these lovely Colonial Britain Double Old Fashion Glasses. 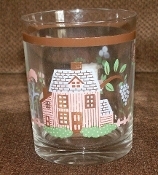 The clear glass is decorated with a pink and blue house whoich has a swying palm tree in the background. There are smaller pink and blue flowers and various animals. The double Old fashion Glasses have a wide brown banding near the upper lip. Each of the available Colonial Britain Double Old Fashion Glasses is in mint condition. The graphics are crisp, the colors vibrant. The Colonial Britain Double Old Fashion Glasses stand 4 inches in height, measure 3-1/4 inches in diameter at the top. These Colonial Britain Double Old Fashion Glasses would be wonderful pieces to add to your bar or collection.